Here’s a mini Physiological Integrity Basic Care and Comfort NCLEX RN practice exam. Use these free practice questions online to measure your current strengths and weaknesses in this section of the test. Utilize your results to help determine where you need to invest your review time between now and your exam date. 5. Your patient has PVD (Peripheral Vascular Disease), and has stage 3 pitting edema in her lower legs and feet. What autonomous nursing action should you take? Elevate her feet above the level of her heart. Increase liquids to two liters per day. Have the patient stand and walk more. Encourage tight footwear to decrease swelling in her feet. 6. Pyrazinamide can cause inaccuracies in which of the following tests? 9. What medication can be given IV to decrease dysrhythmias by reducing irritability in the heart cells? Safety is the nurse's primary concern for a patient who is dependent on a cane for mobility. A – Maintaining and improving mobility is important, but safety is the factor that will insure this. B – Rest periods are a part of safety, not the primary concern. C – There is no data that suggests a nutritional deficit, but a healthy intake is also part of the safety factor when ambulating. Massaging and manipulation of the already damaged tissue will worsen the condition. A – B – D are all true statements that will help the damaged skin heal. Patients who are restrained must have the restraints removed at least every 4 hours to ambulate, reposition, toilet, and socialize. If the patient needs or asks to go to the bathroom in less than 4 hours, this need must be met. A continent patient who becomes incontinent because of restraints has been neglected and abused. Restrained patients are at greater risk for incontinent episodes, decubitus ulcers, loss of musculature, weakness, anxiety, and decreased mental acuity. A – Providing diapers instead of releasing and assisting the patient to toilet is not acceptable nursing practice. It decreases the patient's dignity and violates patient's rights. B – Every two hours is not required unless the patient has a need that dictates this action. D – The patient who must be in restraints should have the same care and choices in their morning routine as an ambulatory patient. He/she should be groomed, dressed, and ready for their day. A patient with a communication deficit does not usually improve with ADL independence. A – The more the patients can accomplish for themselves, the more dignity is maintained and the less self-esteem issues will arise. B – Activities of daily living provide much needed exercise, keeping joints and muscles limber and functional. D – Patients who can attend to their own ADLs maintain mental acuity longer than those who are completely dependent. There should always be assistance close by, but allowing as much privacy and dignity as possible is very important to the patient's well-being. Elevating the lower extremities will help vascular function drain the excess fluid and decrease swelling. B – Increased liquids may amplify the problem, and needs a physician's order. C – Standing will increase the edema. D – Tight footwear can damage the edematous tissue. Pyrazinamide, given for Tuberculosis, dramatically affects the liver and its enzymes. A – This medication does not affect the thyroid test. B – The CBC is unaffected by this medication. D – The glucose tolerance test is not affected by Pyrazinamide. Insulin dependent diabetics should take a blood sugar reading before each meal and before bed. A – Limiting food intake can be dangerous for an insulin dependent diabetic. C – Blood sugar must be taken 4 times a day. Increasing circulation with a gentle massage has many therapeutic effects such as decreasing stress, increasing cognitive function, decreasing irritability, decreasing joint and muscle stiffness, and more. B – Massage can further injure damaged tissue. C – Normal gentle massage does not require a physician's order. D – There is no evidence that massage can directly improve memory. Lidocaine is given intravenously to MI patients many times to treat ventricular dysrhythmias. A – Potassium does not have this mechanism of action and will not decrease the cellular irritability. C – Digitalis slows and strengthens the heartbeat, and does not have the mechanism of action that is needed in this situation. D – Procardia is a calcium channel blocker used for hypertensive patients or those with angina. Go to: NCLEX-RN Physiological Integrity Phsiological Adaption Practice Test Questions for a FREE NCLEX RN review report. The Free NCLEX-RN practice exam questions below provides a good review for the Physiological Integrity Physiological Adaptation section. Use these questions to gain insights into what areas of the test you need to dedicate more time to. 5. Which of the following complications are related to hyperthyroidism? A paradoxical effect of a medication is the opposite of the expected therapeutic effect. For example, a sleeping pill that keeps the patient restless and awake. A – A medication error does not constitute a paradoxical effect. C – Slowed metabolism of a drug is not a paradoxical effect. D – Peaks and troughs do not indicate a paradoxical effect. Lasix, a diuretic often prescribed for CHF patients, causes an increased loss of potassium through the kidneys. Unless the potassium is replaced, severe cramps can result. Lab results would show a decrease in the patient's potassium level. B – There would be no reason to expect an increase in blood potassium. C – Diuretics have no significant effect on sodium levels. D – Lasix has no significant effect on sodium levels. Euphoria is not a sign or symptom of a blood transfusion reaction. A – B – C (Fever, Back pain, and Chest pain) are all common signs of a transfusion reaction. A CBC is the exception. It is the least effective test for acidosis. A – Arterial Blood Gasses are a reliable test to determine the type of acidosis the patient is experiencing. B – Urine pH will show abnormally acidic if metabolic acidosis is the problem. C – An electrolyte panel will show bicarbonate levels in the blood. This dictates the pH value of the blood, and can indicate respiratory acidosis. Hyperthyroidism causes calcium to be leached out of the bones and teeth into the blood making the bones brittle. This complication can lead to fractures. A – Hyperthyroidism is not shown to cause poor eyesight. C – Nephritis is not caused by hyperthyroidism. D – Hyperthyroidism causes weight loss. On an ECG, the P-R interval is representative of the time it takes the electrical impulse to get to the ventricle. This interval goes from the beginning of the P wave through the QRS complex. B – The atrial contraction begins in the middle of the P wave. C – The cardiac cycle is represented by a complete P –T complex. D – The T wave represents the refractory period, or resting phase of the cardiac cycle. A critical complication of pancreatitis is respiratory distress, and increased SOB should be reported immediately. A – Abdominal pain is a normal presenting symptom with Pancreatitis. B – Nausea and vomiting are normal symptomology for Pancreatitis. C – Abnormal, or decreased bowel sounds, are a common symptom of Pancreatitis. Cholestyramine causes deficiencies in fat-soluble vitamins. They are removed from the blood along with the lipids the medication is meant to reduce. A – B – and C (Niacin, Folic acid, and B12) are water soluble, and so are not removed from the body by the medication. 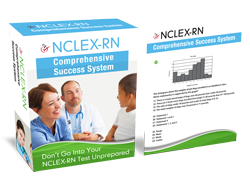 More FREE tips online to conquer NCLEX-RN questions here.